This week, Emily of Lovely Luciano takes on tricky transitional dressing. While we’re all psyched for warmer weather in the future, dressing for the in-between temps can be a challenge. 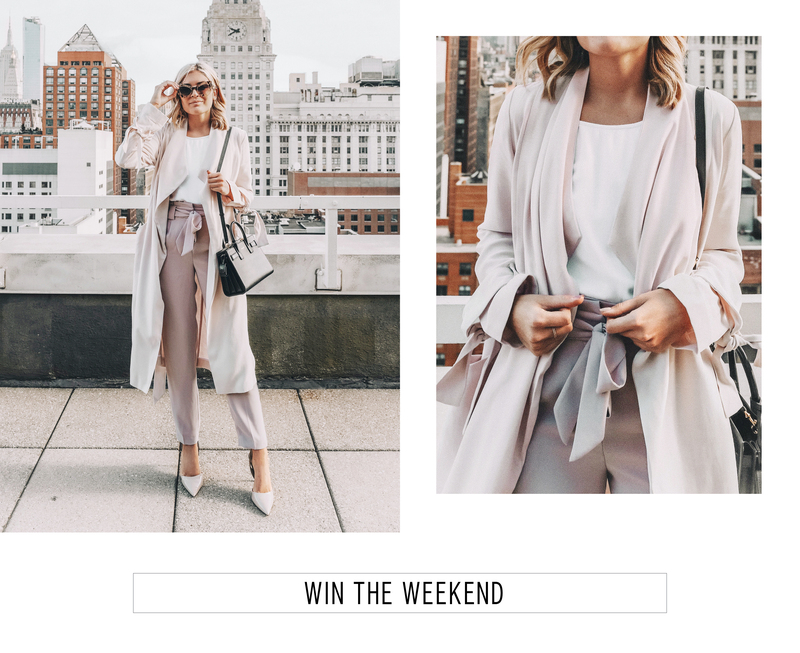 Emily nails the issue with our soft trench, showing us how to style a light blush coat three spring-forward ways. One of the many things I love about fashion is how versatile individual pieces can be. When possessing a limited amount of closet space, it is especially important to find great statement items that are also transitional. Ideally, these pieces should help to dress an outfit up or down, and be suited for daytime or nighttime. Express carries many cute, comfortable and versatile clothing items that are the perfect addition to any fashionista’s wardrobe. I love neutral colors and therefore I was immediately drawn to their neutral-hued Soft Drape Trench Coat. Here are three ways to wear it. It’s great for the office, while also being a good transitional outfit to wear into the night. By pairing high waisted sash tie ankle pants from Express with the pink trench coat it gives off a more professional vibe. This is a great outfit for a lunch meeting where you still want to show of your fashion sense while maintaining a polished, put together look. The next look is a casual, yet chic look. By pairing this trench coat with jeans and two-tone slingback pumps, I feel comfortable while going about my day-to-day activities. This is a great outfit for walking around the city or for wearing out to a casual dinner where you want to look put together while also feeling stylish. My last look is dressy, yet fun! This outfit would be great for a lunch date or a special evening event. I paired the trench coat with a fun polka-dot surplice babydoll dress and classic black over-the-knee boots. Talk about versatile.